Missouri football wide receiver Nate Brown could miss anywhere from six to eight weeks with a high ankle sprain. 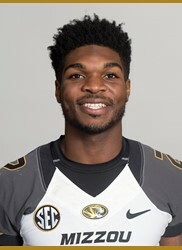 Brown, a 6’3 junior, was as one of Mizzou’s top pass-catching threats in his first full year as a starter in 2015 … Hauled in a team-high four touchdowns and finished second on the team in total catches (27) and receiving yards (326), averaging 12.07 yards per catch. Brown was injured at Monday’s practice and was held out Tuesday for precautionary reasons.